I spent a lot of time tracking this error down. When I started investigating, the error was known only as an access violation, preventing some operations related to data cleansing or fact table versioning. It occurred deep within a series of stored procedures. The execution environment included cross-database DELETE statements, cross-database synonyms, lots of SELECT statements against system views, scalar UDFs, and lots and lots of dynamic SQL. And... I don't have access to the four systems where the access violation occurred. I was able to have some investigation performed on those systems - we learned that by disabling 'auto stats update' for the duration of the sensitive operations, the error was avoided. We also learned that reverting a system from SQL Server 2016 SP2 CU4 to SP2 CU2 avoided the errors. On those systems, reverting to SP2 CU2 or temporarily disabling 'auto stats update' were sufficient temporary mitigations. And once I was able to reproduce the access violation, I generated 16 errors and suddenly couldn't get anymore errors! (I'd later learn that changing the database recovery model from 'simple' to 'full' was the reason the errors were no longer occurring.) I opened a premier support ticket with Microsoft describing the issue and attaching the sqldump files, and explaining I wasn't able to continue generating the errors. Fortunately it was only a few hours later that I was able to start generating errors again by proceeding through my process of reproducing errors and simplifying the context much more carefully than previously. At the bottom of this post is a minimal reproduction of the access violation error in SQL Server 2016 SP2 CU4. As is, the statements will create a new database t1 with simple recovery mode and 'auto stats update' enabled. Those are the system state requirements for the access violations. If you recreate the error yourself, please be aware a memory dump will be created. The execution context required for the access violation requires a stats object that is already created but empty. So a stats object for a clustered index(or primary key clustered index) on a table that was just created, or has been truncated. The underlying column must be BIGINT data type. With INT, the error does not occur (or at least doesn't occur until a much higher threshold of activity). Within the same explicit transaction, at least 1024 rows are inserted into the table using the TABLOCK or TABLOCKX hint (without a hint no error will occur), and then a query requests the stats (resulting in the auto-update stats activity). Then the access violation occurs. If you'd like to follow along, here is the repro code. Here's what the output of the repro code below looks like on SQL Server 2016 SP2 CU3. Not terribly exciting. Note that at the end of execution, the stats for ci_x are still empty. That makes sense - a count(*) from a table can't really benefit from stats. It doesn''t have an operator accumulating results over time or anything else requiring a memory grant. Doesn't have a join operator requiring a row estimate. Indeed, the results look identical in SQL Server 2016 SP2 CU5. No auto stats update, no error, stats still empty as the code completes. But what happens in SQL Server 2016 SP2 CU4? Just after the rows are inserted - and before the results of the count(*) are returned - the query encounters an access violation. 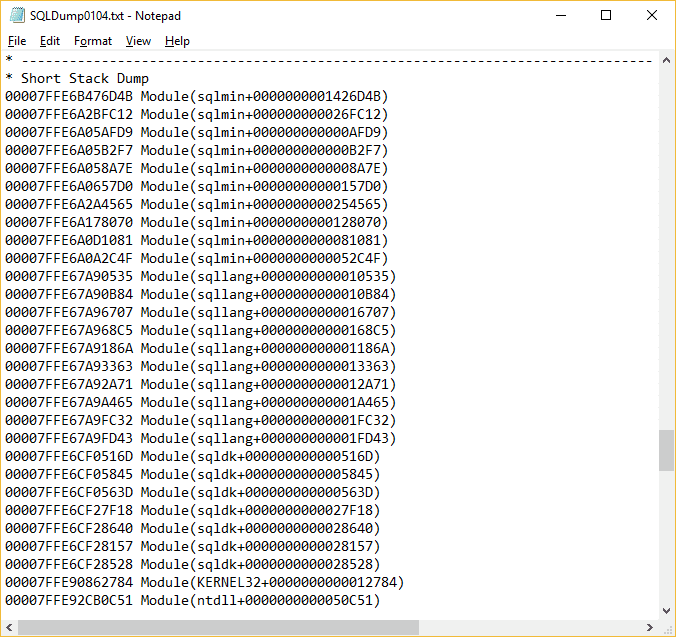 And here's the short stack dump included in the SQLDump****.txt files. It really looks like SQL Server 2016 SP2 CU4 is a loner in this regard - asking for an auto stats update in a context where the stats are immaterial to the query itself. We'll see. If there is a fix forthcoming in SQL Server 2016 SP2 CU6 or beyond, I'll update this post with a reference to it. Perhaps instead I'll learn that this issue was coincidentally fixed in SQL Server 2016 SP2 CU5. I've looked through the CU5 kbar a few times and didn't see anything I thought was related. I tried to document within the repro code potential 'bandaid' workarounds if you run into this access violation - just something to tide you over till can upgrade to a fixed version. For example, switching to full recovery model or disabling auto stats update. Unfortunately, innocculating against these AVs at the system level may come at too great of a risk in some cases. There are workarounds possible in the code as well. Eliminating hints in the insert might work without unreasonable cost. Alternatively a manual stats update before the count(*) may be acceptable. All right - that's it for now! Ciao!! I decided to check SQL Server 2017 as well. CU11 - no error. CU12 - no error. So be on the lookout for this access violation in SQL Server 2016 SP2 CU5 and SQL Server 2017 CU13.